Medicare enrollment is on the rise, and it shows no signs of slowing. Consider this: It is projected that the 65+ population will double in size by 2030 when it will reach 71.5 million, and by 2050 it will be over 86 million.1 With this growth in Medicare buyers, no one should be surprised that an increasing number of consumers are looking for supplemental coverage to bridge the gaps left by Medicare. The need to effectively educate and engage consumers has never been greater. At the end of last year, we conducted consumer research to learn more about how the senior population navigates the health insurance decision-making process, and what level of engagement exists between them and insurance agents. Topics we explored through this latest study included consumer engagement with agents and the role the agent plays in the decision-making process, the health insurance education process, and when and how consumers evaluate their coverage options. In this article, we discuss what we found to be some of the most useful takeaways. Participants were obtained through a national survey panel. Responses were collected via telephone and online and were weighted based on Internet usage levels and leveraging Pew Research statistics. All participants were U.S. residents and had health insurance coverage beyond Medicare Part A and/or Part B, with additional coverage of either Medicare Advantage or Medicare Supplement insurance. Nearly 60% of consumers surveyed shared that they received assistance from a professional. Surprisingly, 56% had already made their decision on whether or not to enroll in Medicare prior to receiving assistance from a professional. However, many may have selected a different option after meeting with the agent. For those that received assistance with the decision-making process, fewer than 20% of them were contacted without having any prior conversation with that agent. The majority - nearly 40% - selected an agent based on a recommendation from a family member or friend. Referrals also came from former employers, physicians or financial planners. Only about 20% of consumers said they connected with their agent by responding to an advertisement or mailer. This was an interesting finding considering the deluge of marketing materials sent to consumers upon turning age 65. In our 2013 consumer study, we found that individuals received so many marketing mailers about Medicare Supplement insurance options that they only paid attention to the first few received and then tossed the majority of them in the trash without reading them. Unfortunately, nearly a third of consumers that indicated they were seeking a high degree of assistance did not end up working with a professional at all. These individuals either didn’t know where to turn for help, or chose to seek advice from family or friends rather than a professional. Individuals with this profile would therefore be excellent candidates for outreach by agents as they aren’t receiving the level of assistance they seem to desire. Our data shows that the majority of the time agents clearly influence consumers’ buying decisions regarding a Medicare Supplement plan. For example, among the cohort of consumers who felt they needed a lot of direction/advice on which plan to select (and for whom an agent made a recommendation 72% of the time), they reported going with that plan nearly 95% of the time. Those consumers went with that plan 94% of the time. Even with those individuals who felt they already knew or had a strong idea about which plan they wanted, agents made recommendations 60% of the time, and once again, the recommended plan was selected the majority (88%) of the time. This could indicate that consumers who initiated contact with the agent had already done research on which plan they wanted, and had determined their best options from the various companies available. Another significant result we found was that when consumers had received no previous assistance at all from an agent, they were far more likely to select a company they’ve used before. About half of participants indicated this, and another 45% reported they selected a company that they were aware of but had never used. Interestingly, when an agent provided assistance, consumers were more likely to select a previously unknown company. Among those that met with a professional, over 65% had a one-on-one meeting. While consumers appear to prefer in-person contact, agents seem to be missing opportunities during those meetings to advise their clients on other insurance products that may be of interest. 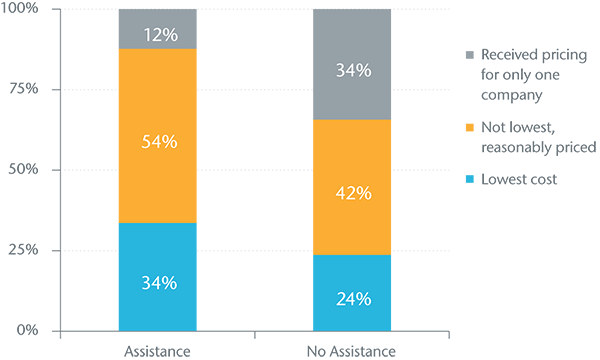 In fact nearly 80% of respondents shared that they do not work with the agent to purchase any other product. In addition, nearly half (46%) of consumers reported that their health insurance agent had not kept in contact with them once they sold the policy. However, when asked how often consumers wanted to be in touch with their agents, the majority (46%) said at their policy anniversary date. About a third reported wanting to be contacted with important updates. Of those that prefer to have an ongoing relationship with their agent, nearly 70% said they prefer contact by telephone or email. Apparently, this is an area where agents are not meeting their customers’ needs. We also asked participants ages 66–75 if they had changed their Medicare Supplement plan selections or switched companies since they originally purchased their coverage. We were surprised by their responses - less than 30% had made a change to their coverage since turning 65 and selecting Medicare. The older segment of this group (those ages 71–75) were more likely than the younger group (65–70) to have done so. Even more surprising was that the consumers, not agents, had initiated this switch - nearly 60% of the time. According to our findings, agents initiated the switch less than 10% of the time. While consumers appear to be driving these decisions to switch companies, agents definitely can help them understand how they compare. Consumers clearly value recommendations provided by agents concerning Medicare Supplement plans, regardless of whether they initiated the contact with the agent or not. They prefer to have an ongoing relationship with the agent and are looking for the agent to stay connected with a phone call or email at the anniversary date, or with important updates to share. 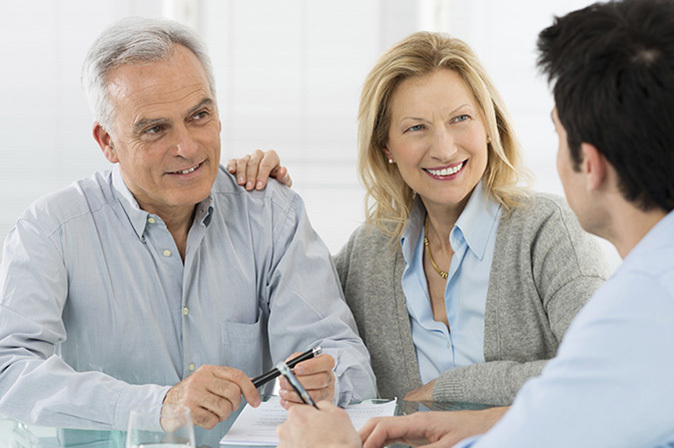 Referrals from family members, friends, physicians and financial advisors are the more common ways that consumers get connected to agents. Therefore, we believe that maintaining strong relationships with consumers after the initial sale is the best way for agents to secure new business opportunities. While agents do not appear to drive consumers’ decisions to switch plans or companies, when consumers are considering if they want to make a change, agents are helpful in comparing the options. When making a decision to switch, consumers were more likely to choose a lower cost option. Another way agents help consumers to make decisions is to introduce them to companies that are not familiar to them. The likelihood of consumers selecting an unfamiliar company for coverage increases if an agent makes the recommendation. We will share other findings from this survey in the coming weeks in blog posts and webinars. Our latest quantitative study supports a variety of findings from our initial consumer research on seniors. For example, some consumers, also known as “Info-Seekers,” are far more likely to follow a do-it-yourself approach when researching health insurance options after age 65. These individuals will drive the decision-making process but still value agents’ recommendations. We saw a strong tendency for these individuals to be healthy, and healthier consumers are less likely to desire a high level of agent assistance. Overall, agent involvement in the decision-making process is valued when consumers are selecting which plan and which company for purchasing their coverage, and they are less likely than unhealthy consumers to review their health insurance options every year. The data also indicates that this group of consumers received a higher level of formal education and has higher household incomes. Let’s face it — that’s what many sales presentations sound like. If you’ve been on the customer side of one, all you can think of is when it will end. And if you are on the selling side of the table, you might be thinking the same thing. The way to convert a painful sales process into a powerful, productive conversation is to ask questions. Not just getting-to-know-you questions, although they are important. But getting at the probing questions that provoke deep thought and produce real answers for clients’ problems. 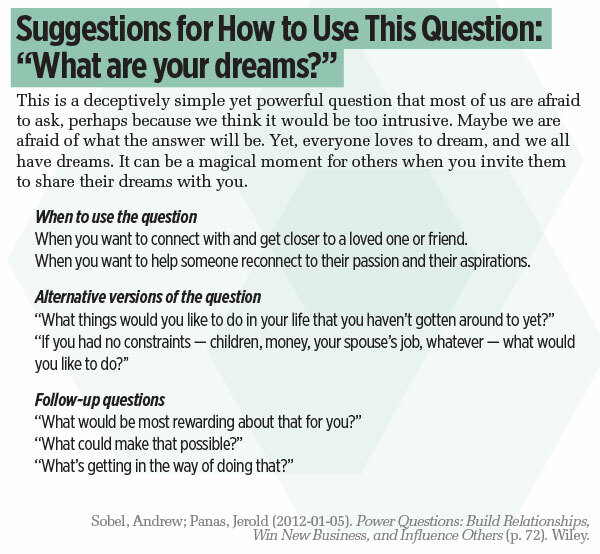 Questions are the cornerstone to building trust that leads to business, according to Andrew Sobel. He has made strategies to build trusted business relationships his life’s work. He has written eight best-selling books on the subject, such as Building C-Suite Relationships, Clients for Life, Power Relationships and Power Questions. He has also published more than 150 articles and contributed chapters to four books on leadership, strategy and marketing. Andrew has worked for more than 30 years as a strategy advisor to senior management and an executive educator and coach. He has had many of the world’s leading companies as clients, such as Citigroup, Experian, Bank of America Merrill Lynch, Towers Watson, UBS, Lloyds Banking Group, Ernst & Young, and Deloitte. What he has learned and taught is that the best way to become trusted is to draw out clients’ or prospects’ deepest concerns or dreams. Who wouldn’t want to be that kind of agent and advisor? And the best route there is through the right questions. 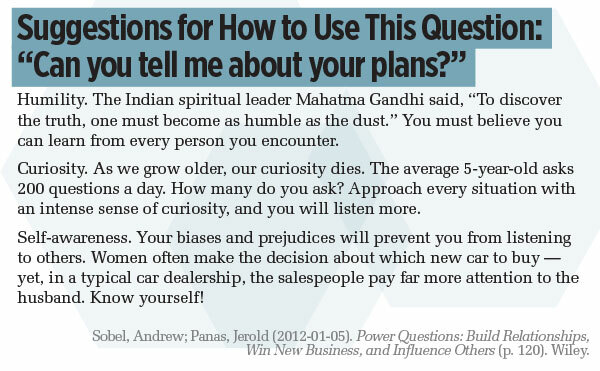 In this interview with Publisher Paul Feldman, although Andrew is not only doing the answering, he is also presenting some provocative questions that can improve just about anybody’s sales game. FELDMAN: Why are power questions important? SOBEL: It’s because the sales environment has changed. I say this not just as someone who studies this and trains lots of professionals, but as someone who is a target for lots of people who want to connect with me and sell me things. Sophisticated buyers want to feel like buyers and not like they’re being sold to. People want to feel like they’re buyers because they’re educated now. Anything we want to buy, we go on the Internet and we research it. So, when I walk into Best Buy, as good as some of their salespeople are, frankly I often know more about what they’re selling than they do. People really want to feel like a buyer, and questions are a great way to do that. It’s a fundamental part of the way you do business with clients. FELDMAN: Many people believe that they win sales by being quick on their feet and saying the right thing the right way. But you say that knowing the right questions is far more important to connect and persuade. Would you explain that? SOBEL: Of course you have to be extremely knowledgeable about your subject matter and your products. But what makes people stop and listen is not when you are lecturing them or pushing something on them, citing all the benefits of a particular product. It’s when clients or prospects think a little differently because of the thought-provoking questions you are asking. Consider the greatest thinkers in history. 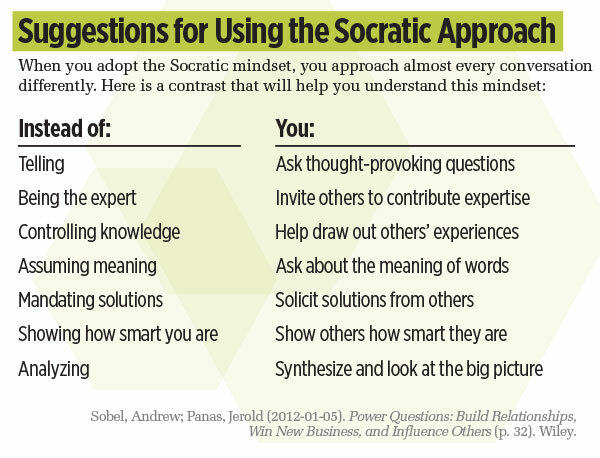 Think of Socrates, who of course developed the Socratic method of teaching by asking questions. Or people like Einstein, who had a very childlike sense of curiosity. Or people like Peter Drucker, who is considered the greatest management thinker of the 20th century. Peter Drucker had five questions he asked his CEO clients. Whenever a leadership team would come out to California to meet with Drucker for a workshop, he would walk them through five questions that he had developed. Our greatest thinkers were all more focused on the questions that surface the important issues so that we’re talking about the right things. If you step back, you realize you can really come across as wise and experienced when you are asking good questions. FELDMAN: You said that you could overcome anything if you ask why. What did you mean by that? SOBEL: By way of background, the idea around “why” was developed by Toyota. The company’s founder, [Sakichi] Toyoda, told his engineers they can diagnose any quality problem by asking “why” five times. Those were Toyota’s five whys. The point is when someone tells you something, usually there’s a higher-level issue that you really want to connect to. So, if a client says, “I want to set aside some money for my children’s college,” it may seem ridiculous to ask them why they want to do that. But you may want to ask him to tell you a little more about that: “Why did you decide to do that now? How does this fit into your overall thinking about the responsibilities that you want to have when you finally retire?” There are always bigger issues above the specific request or the specific desire. So, “why” can be a very important question, but you have to be careful with it. Why can come across as critical, carping or disapproving. You need to ask it with the right demeanor. 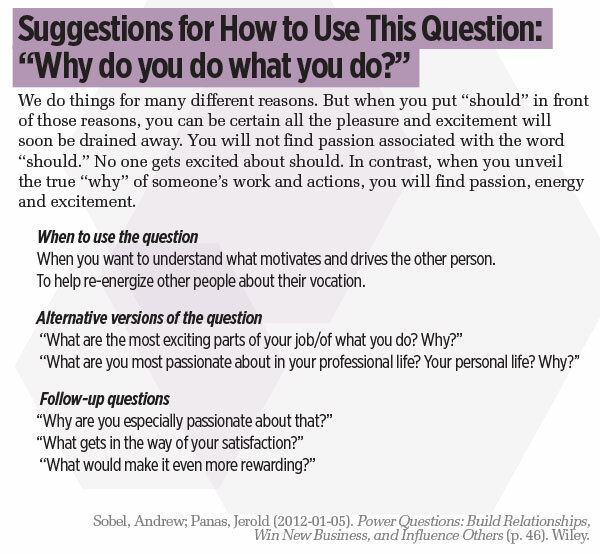 But used the right way, “why” can be a powerful question. It broadens it from a technical discussion about alternatives for saving for college to perhaps a larger discussion about that person’s goals and where they see themselves going. FELDMAN: What are some “Power Questions” you recommend to break the ice and create new relationships? SOBEL: First of all, let’s recognize that there’s a process. At one end, you meet someone for the first time. And at the other end, that has developed into a relationship where they’re a client. Obviously, a lot of things happen between those points, so we have to break it down. Your best friend, especially at the early stage, is curiosity. It’s a genuine abiding curiosity about other people. I like to start out with some icebreaker questions that are not going to be too deep and won’t upset anyone. An icebreaker question could be as simple as “Who are you?” or “Why did you come?” or “What’s your connection with this event?” that tells me what sort of business you’re in. You’re just breaking the ice, but you’re making it about the other person. 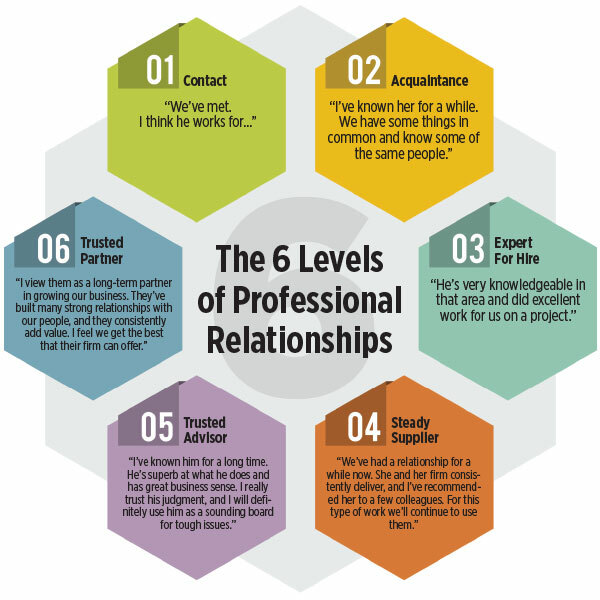 Always remember that the process goes something like this: We build some initial rapport that may lead to an additional meeting or additional points of contact, which creates familiarity, which may create likeability, which leads to trust, and then that can be the basis for a business transaction. FELDMAN: What’s the next step after you break the ice? SOBEL: At some point, this conversation is going to shift to what you do, and here’s where it’s important to be able to describe that in a compelling way. That’s something just to think about because what you’re trying to do is get the other person engaged and excited. To get relationships and then drive those relationships toward possible business, you have to learn a little bit about the other person’s agenda. What are their top three to five important professional priorities and their three to five personal priorities? FELDMAN: Should you be addressing and uncovering their professional and personal priorities every time you speak? SOBEL: Absolutely. But you don’t do this all in one conversation over cocktails. I want to know their priorities because what I do may or may not be very relevant to their concerns. So, I’m trying to surface their concerns and learning something about what’s important in their lives. On the other hand, I want them to understand what I do and how I help people. It’s going to be the marriage of those two that ultimately leads to a business relationship as opposed to just a nice-to-know-you relationship where you send a Christmas card every year. I do this by gently asking questions. FELDMAN: How do you move from the initial conversation to a meeting? SOBEL: In order to pique their curiosity about meeting with you, you have to establish your credibility that you do some really interesting things for people just like them. One way to do that is to ask what I call a credibility-building question. 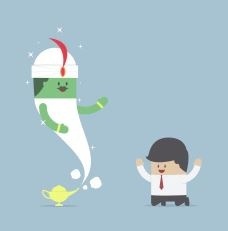 You build curiosity and, of course, curiosity is your most powerful tool in the sales process. FELDMAN: How do you turn a pitch into a highly engaged collaborative working session? SOBEL: Most busy people don’t like to sit down and be presented to. They want to have a conversation. If you’re going to pitch a proposal to a client, think about it as having a conversation together. We’re going to have a conversation about this issue as opposed to my needing to pitch them on this proposal and walk them through every single aspect of it. I think most people don’t do a good enough job of letting the client define where they’d like to focus the conversation. With one simple question, they’ll quickly say they read the proposal and what their concern is. It’s better to address that than waste half an hour of their time lavishly going through the slides of the spreadsheets that you’ve prepared. FELDMAN: What are some questions to get a deeper understanding of a client? SOBEL: You might ask questions that increase personal understanding. Those kinds of questions often aren’t covered in sales training methodologies because increasing personal understanding doesn’t specifically have to do with the sales opportunity. It comes under the category of building trust and rapport with the person. I’ve asked some very senior executives that question and gotten incredible answers that help me understand them and help create additional opportunities to work with them. FELDMAN: What are some other tips for connecting with the C suite? SOBEL: One of the relationship laws in my book Power of Relationships is to walk in the other person’s shoes. If I’m meeting with a C-suite executive I’m thinking about what pressures they are under. The fact is, C-suite executives, people in senior leadership positions, are under a different set of pressures. Turnover in those positions has accelerated. They’re time-starved. They’re under enormous pressure to perform. They’re struggling to balance their family life and their work life. And so you have to understand what that’s like. In a C-suite meeting, focus on adding value for time. For top executives, their very first question to themselves is, “Am I going to get value out of taking half an hour out of my day to meet with you?” You’ve got to have a very clear value proposition about what piques their curiosity to spend that time with you. I’m exaggerating, of course, but you have to walk in as an equal, which means you’re neither looking up to them nor looking down at them. You’re treating them as a peer or a friend. You’re not overly familiar, but you’re there as a peer because you’ve got very valuable knowledge that is going to help them. I think the third thing is it’s important to understand that C-suite executives tend to process information in very short chunks. Most C-suite executives don’t have the patience for a long drawn-out introductions as in someone spending five, 10, 15 minutes talking about something. They process things in three- or four-minute bits. You want to have an opening hook just the way a great rock song does. Think about the Rolling Stones’ Satisfaction, which of course dates me, but it’s still a popular song. You know you have that great Keith Richards guitar hook that starts it out. Or the Beatles Help! You know the song starts out with this enormous cry for help. You’ve got to take some risks. When you meet with a C-suite executive, if you play not to lose, you lose. You have to play to win. You’ve got to be a little bolder because if you go in and you’re like, “Oh my God, we’ve got this meeting with the CEO of this company,” your tendency is often to play it safe, be anodyne, not rock the boat and not ask him too many challenging questions. That’s often a losing proposition. So, for example, in my context a challenge question might go something like this: A CEO might say, “Well, Andrew, we’re growing our client relationships 5 percent year in and year out.” I might come back and say, “That sounds good but some of my clients are achieving 10 percent. Do you think 5 percent is the best you can do?” I’ll ask challenging questions like that. FELDMAN: Do you have any insight into what might be a challenge question in insurance or finance for an executive? SOBEL: Top executives are always interested to know what other people are doing and what’s going on in the marketplace. So it’s being able to summarize very powerfully the critical things that have happened in the past 18 months that they need to know. I’ll give you an example. I talked to some lawyers because my wife and I were redoing some of our estate-planning. One of the lawyers said, “Well, Andrew, let me summarize for you some of the trends in estate-planning among people like you who have your kinds of needs and family.” He rattled off about five things. I read a lot and I’m pretty educated, but he told me a few new things. That drew my interest It was a great credibility-builder. FELDMAN: What are some good closing questions? I don’t mean to be flip, but that’s a question I occasionally hear and I think it’s outlived its usefulness. I would be careful about cutesy things like that. I would also be careful of presumptive close questions. I think you earn the business by adding value and showing how you can solve important challenges for the client. I don’t like presumptive close questions like, “Is there anything getting in the way of your signing this today?” There are all kinds of questions like that. Or “For the next meeting, would you like to meet at 9 a.m. on Wednesday or would 4 p.m. on Friday be better for you?” Maybe I’m different from a lot of people, but to me I like being in control and that’s trying to take the control away from me. FELDMAN: Those tactics can seem forced and controlling. But what do you recommend to make sure you get the next meeting? SOBEL: The goal of every meeting is to get another meeting until you close. You create the follow-on by evoking their curiosity that you might be able to help do something unique for them or help them with something. At the end of a conversation, I have a couple of techniques. One is more traditional, which is to say something like, “Based on this conversation, I get the sense that there are a couple of areas where you may have a need. I’d like to suggest as a follow-on that I prepare an analysis for you around issue X or issue Y that I think would help you make a better decision about it.” You suggest a follow-up step. That’s possible. Or they might say they aren’t really sure. That’s a very different position than being aggressive and pushing something on them. They’re now reaching toward you, and that’s where I want the person to be. I want them leaning toward me, saying this was a helpful discussion and that they’d like to talk again. I would just caution people against being overly scripted and sounding like they’ve got this list of memorized questions. 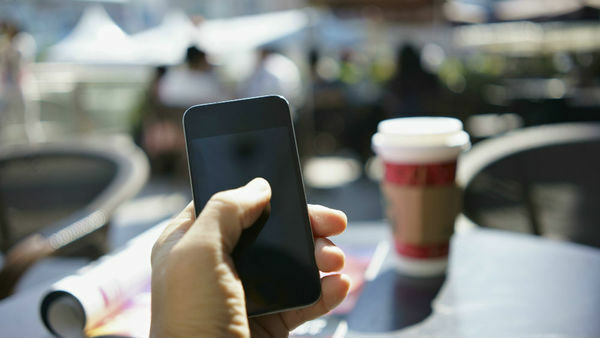 Buyers your readers are calling on are much more sophisticated than they used to be. The salesman’s job used to be to inform people and give them product knowledge at the beginning. Now it’s actually problem-solving. It’s “Tell me what you’re trying to accomplish. Tell me your goals.” Then it’s helping solve the problem and create alternatives. The No. 1 relationship law in Power Relationships is based on great conversations. It’s not one person showing the other how much they know. That’s a two-way conversation as opposed to showing them how much you know about the insurance business or how much you know about financial planning. So, we could leave it with that. You want to have a great conversation with someone that informs them, educates them, gets them interested and advances their thinking. And it all starts with questions. The 2015 Medicare Trustees report was released last week with the news that the long-term outlook of Medicare has improved overall. It has already been reported by several sources that Part B premiums are projected to increase by 52%, but what hasn’t yet been reported is that the same section of the report also projects that the Part B deductible will also increase by 52%. This could mean a double-whammy for many seniors who will end up paying a higher premium for their Part B coverage, and also end up paying more out-of-pocket costs in order to meet their deductible. The projected increase in the Part B deductible also impacts Medicare Supplement carriers, and CSG Actuarial is working with many of their clients to analyze what the impact will be to Medicare Supplement claim costs for 2016, as well as how it translates to rate adjustments being filed here in the next several months. CSG Actuarial estimates that the increase in the Part B deductible would lead to 4% higher Plan F claim costs in 2016 (this is compared to no increase in the Part B deductible, excluding all other medical trends, and is based on age 70 claim costs). This increase, combined with normal medical trends could mean Plan F claim costs could be 8% higher in 2016. Will carriers file for 2016 rate adjustments to match the claim cost increase, or will they take a longer term approach? Other Medicare Supplement plans, such as Plan G, will be affected differently than Plan F. Since Plan G does not pay the Part B deductible, but does pay the Part B coinsurance amount, the claim costs associated with Part B payments may actually be down slightly overall. Table V.E2 of the Trustees report shows the 2016 Part B deductible is projected to increase to $223 per year, which is up from $147 per year in 2015. The large projected increase in the Part B deductible is due to the projected increase in the Part B premiums (from $104.90 to $159.30 per month) which is caused by the hold-harmless provision in the law and the expected 0% cost-of-living adjustment to Social Security. It will be interesting to watch how Medicare Supplement carriers respond to this projected Part B deductible increase. Though the Part B deductible is not officially determined until closer to the start of 2016, many Medicare Supplement carriers are already beginning to file rate increases for 2016 effective dates. The big unknown is whether the cost-of-living adjustment for social security will ultimately be set at 0% as expected, or if a positive cost-of-living adjustment will be implemented. Unfortunately for carriers filing 2016 rate adjustments in the next few months, there is no way to know, and they will have to make decisions based on what is projected today. Succeeding as an insurance agent means making use of the best available tech toys. From keeping business data accessible to having client contact information at your fingertips, technology augments success. Choosing a few exceptional apps and putting them to work for your business may result in a marked positive impact on revenues. Beyond that, apps are great for saving time (and maintaining your sanity during busy workdays). Many people claim they do some of their best, most creative thinking when sitting…in their car, stuck in traffic. Imagine turning a smartphone into the perfect assistant, one that can not only interpret your musings, but also translate them into text, whether for social media posts, emails, or notes and reminders. Dragon Dictation allows you to work (safely) while driving, walking, or even working out. Dragon Dictation is virtually hands-free (you must tap the screen to start and stop dictation). It transcribes speech up to five times quicker than it takes to type out on a keyboard. Users laud its amazing accuracy and ease of use. For insurance agents, that means creating follow-up emails while in the car returning from an important meeting, or creating notes immediately after an initial meeting with a potential client. Sign or route the document for signature. Send the document to its final destination. The signatures are legally valid, but the app offers additional signature verification options by linking to DocuSign ID cards (note that this service may incur additional charges). Reviews on Google’s app store mention DocuSign’s ease of use, convenience, and helpful features. With many businesses trying to go “paperless,” digital signature capability is a must. DocuSign provides quick client interactions despite different locations, increases revenues by quickly obtaining signed policies, and increases form completeness and accuracy. It adapts to your work style while assisting with gaining and keeping clients. It has an intuitive and engaging design that ensures consistent productive user experiences. It works on any device because it is web-based. It offers comprehensive support and the ability to integrate third-party applications. It manages different business lines by mapping policy details. Since QQ Catalyst can be accessed from almost any device, you have immediate access to client records and policies from just about anywhere. Chances are that you spend a fair amount of money on online leads. Making the most of results provided by lead generators involves moving quickly and effectively when a new lead comes in. Specialized apps that generate alerts regarding new leads make quick response possible, regardless of whether or not you are at your desk. One example is iQ Agents, the mobile component of Insurance Quotes lead generating services. It permits users quick access to information on incoming leads. Beyond that, it grants access to InsuranceQuotes.com account features. Technology is an incredible tool for creating and keeping insurance business. At all stages of the process, there are apps that provide great support. Even if you are an aspiring insurance agent, there is an app for you. Life & Health Agent Prep helps prepare you for insurance licensing exams through multiple choice sample questions and flashcards that you can access at any time, for as long a time as you wish.